With a year and a half in the books, how have these 15 hires performed? After the 2015 season, 15 programs outside of the "Power 5" made new head coach hires -- either to replace their management due to on-field performance or to replace their rising start head coaches. As we know, the first year has a lot of randomness for a new coach: the state of the team you take over matters a whole lot. 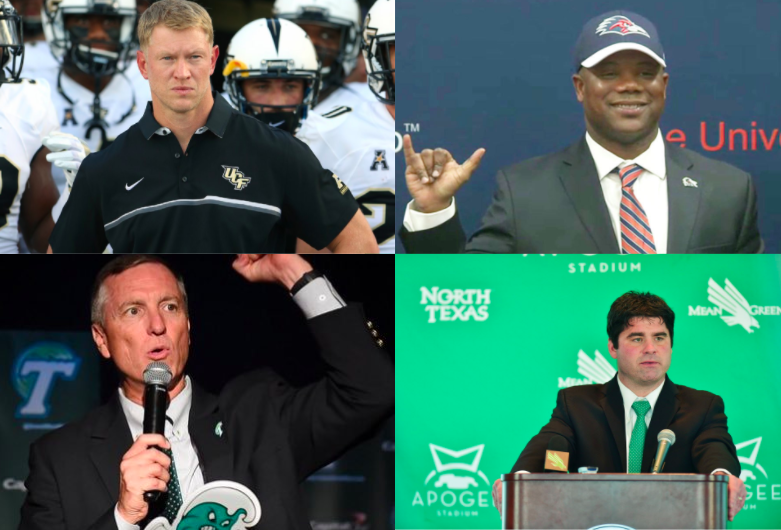 Now that we are nearly midway through 2017 though, I wanted to rank the 15 head coaches who were hired after the 2015 season and see how everyone is doing. To do that, I needed some numbers. I kept this simple. I took an average of where your team ranked in 2015 and this week in 2017 in both Bill Connelly's S&P+ Rankings and ESPN's FPI Rankings. I took an average of those start and end rankings for your team, and then I ordered the coaches by how much their program rose or dropped under that compsosite ranking. There are certainly other ways to do this, but I thought we'd get a pretty clean snapshot of whether your team is moving up or down in the world under your coach with a season and a half in the bag. If interested, here's my spreadsheet. From the spreadsheet, the top four "on the rise" coaches from this class have a clear -- if expected -- similarity: they took over programs that had fallen to the bottom of the food chain and showed clear improvement. Frost is in a cut of his own at this point, as UCF became a serious contender for a NY6 bid just a year and a half of a winless final season with George O' Leary. I haven't followed C-USA that closely, but Littrell surprised me. The Mean Green are coming off back-to-back wins to open conference play this season. That's our guy. Tulane has been trending up just about every week this year in the rankings, especially as preseason projections have been removed. Admittedly, a year and a half is often not enough time to see serious results, and these coache have seen slight improvement or stayed mostly the same so far. That's actually the end of coaches who have seen their team's position improve compared to the end of 2015. Now we get into the slight drops. In this next group, Withers is probably standing out since he inherited a bad Texas State team and has seen it continue to struggle. This is especially apparent as rival UTSA has surged under Frank Wilson, and they started in nearly the same spot. Important thing to note is that Norvell is the first coach on this list to inherit a top 50 program as Justin Fuente left for Virginia Tech. Memphis was still projected to win their division this year, though injuries may have sacrificed that chance. Toledo technically dropped a bit but still looks the part of a standout MAC program. His predecessor, Matt Campbell, left for Iowa State after a heck of a run. Hopson inherited a good Southern Miss team, albeit one that had to deal with Coach Monken suddenly disappearing for the NFL. That said, the Golden Eagles have been a step slower this year. Steven Godfrey from SB Nation made the argument this week on Podcast Ain't Played Nobody that the Pirates may need to accept that they could be on the bottom tier of the AAC for a while. That would be a big hit for a very passionate fan base in Greenville. This one is simple: Sitake took over an excellent BYU team from the Bronco Mendenhall days, and that have fallen very flat this year. Remains to be seen if they can turn things around, but the Cougars have looked more like a low tier G5 team than a powerhouse so far. GaSo has plummeted under Summers, and things got even worse this year after suffering a home loss to FCS New Hampshire. Southern has gone from a top 60 team in both ranking systems to one of the worst in FBS in just two years. Jinks saves Summers from last place, but a big part of that was how good Bowling Green was when Dino Babers left as one of the hottest coaching candidates in the country for Syracuse.